Our Satisfaction Guarantee is just one good reason to buy your bike from us. We want you to love your bike. That's why you can call do-over if you get home and you don't hit it off. A 90-day Guarantee. Seriously. Our job is to get you on the right bike and on the road. But, if for some reason you aren't happy with the match 90 days after purchase. Bring it back. We want you to love your bike. Don't like the color? Bring it back. Thought you were a roadie but want trails instead? Let's swap. Realize a cruiser is more your style? Let's get you sized for that. When you buy a bike from us, derailleur and brake adjustments are free for the life of the bike. Hear squeaks, creaks, and groans? Get over here and we'll check it out. With Trek, Cannondale, Electra, Seven, Moots, and more, we have the right bike for your riding, whether a joy rider or aspiring podium finisher. Ride now, pay later. 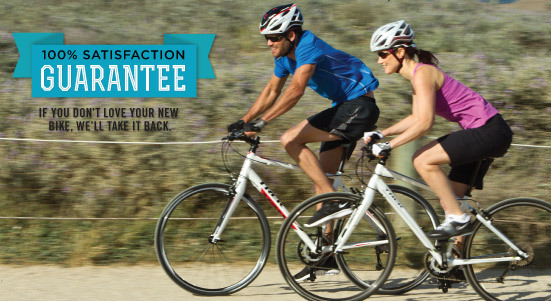 Take advantage of Trek financing and you can have immediate gratification with no interest.